I know how busy most parents and guardians are, but if you are having an asthmatic child it is wise you also place the health of that child of yours in high priority. This is very much important in periods they are going back to school, because you will be spending little or no time with them. You can administer a preventer inhaler to that child every morning before he or she heads off to school. Do not wait for symptoms. Other tips for successful control of asthma symptoms include reviewing inhalers, and creating an asthma action plan with your child’s doctor. Remind your child to avoid triggers like dust and mold and inform the school nurse about your child’s condition. The tips below on how you can handle child asthma are courtesy of the Department of Health. 1. Schedule a checkup with your child’s doctor. Even if your child’s asthma is well controlled, your health care team can help you keep control. Discuss with your child’s doctor an asthma action plan. This can be shared with the school and school nurse to help with your child’s asthma care. Have the doctor review inhalers. Make sure you have a preventer inhaler (usually orange, brown or purple) for control and a reliever inhaler (usually blue) for asthma attacks. Your child should be using a spacer with inhalers. Have your child’s doctor sign any forms from the school for them to carry and use their rescue inhalers while at school. Make sure vaccinations are up to date. Children with asthma are advised to have an annual flu shot. 2. Teach your child about their asthma. Children should understand their asthma triggers, symptoms and action plan. 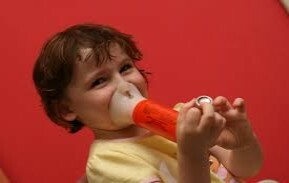 Instruct your child how to use an asthma inhaler and spacer correctly. This may take some practice. 3. Please check inhalers. Empty and expired inhalers can be a problem if your child has an attack at school. 4. Rescue inhaler(s) and spacer need to be sent to school every day. Place them in a plastic zip-lock bag with their name on it. Children should not share inhalers or spacers. 5. Establish a good routine. If your child has asthma triggers such as dust, mold and colds, he or she should start taking a preventer inhaler now before school starts. Getting this early protection on airways will help reduce asthma symptoms. Healthy habits such as eating well-balanced meals, drinking plenty of water, getting plenty of sleep at night, daily exercise and good personal hygiene are all important to keeping your child healthy at school. These steps will help keep your child prepared to take in all the new experiences of the school year by handling the asthma. Feel free to share this post, you never can tell the parent, guardian or children that needs it. Thank you!